Print & Digital, You Can Have It Both Ways! The world might be going through a digital transformation, but it isn’t happening overnight. Some organizations are trying to go all-digital, all at once, while others are moving more cautiously, maintaining many of their traditional systems for now. We talked to over 1,000 corporate learners and asked them how they preferred to access their training materials. Despite the obvious trend towards digital in corporate environments, we found that learners were still divided on the subject. 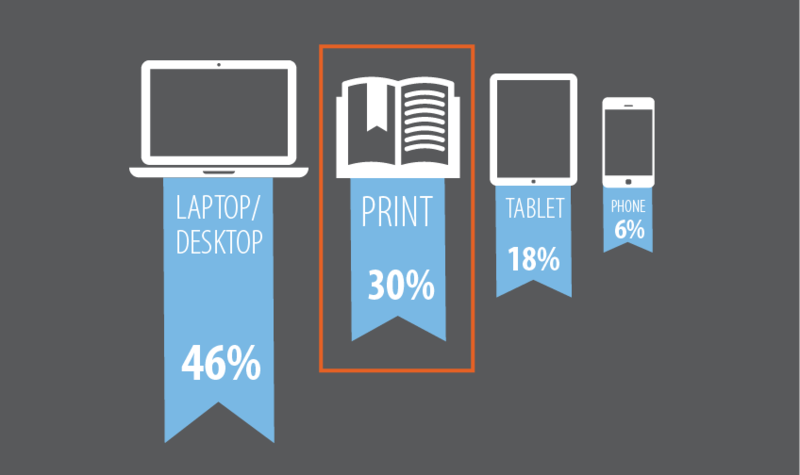 While 46% said they preferred to access their materials on a laptop or desktop and 24% preferred mobile access, there were still 30% of the learners that said they preferred printed materials. That’s nearly 1/3 of your customers! About the only thing all respondents agree upon is that the choice should be theirs to make. Given this, L&D professionals and Training companies face an uneasy decision. Do they re-author their course material as digital-only or mobile-friendly for their fastest moving customers? Or, do they utilize their existing content to continue to provide printed materials for more traditional customers? SharedBook answers this challenge by providing a single integrated platform that encompasses complete digital and print capabilities. With SharedBook, you can distribute secure, mobile-ready eBooks, printed copies, or both - on demand without ever leaving the platform. By leveraging our partnership with FedEx Office, we are also able to offer the fastest service and the lowest printing prices in the industry. With SharedBook you can choose free next-day delivery, or free same-day pickup from FedEx Office’s 1,800+ US locations. No more long lead times or expensive shipping charges. You don’t have to try to win the print vs. digital tug-of-war. With SharedBook, you really can have it both ways. Want to know more? Check out this video for a walk through of printing with SharedBook or schedule a meeting with one of our representatives.